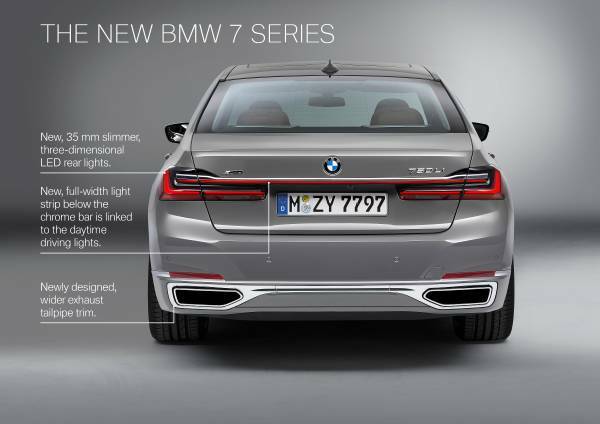 The new BMW 7 Series will continue to be offered in standard and long wheelbase body variants. The longer version of the luxury saloon has a wheelbase extended by 14 centimetres over the standard car to 3,210 millimetres. Both variants have grown by 22 millimetres over their respective predecessors. 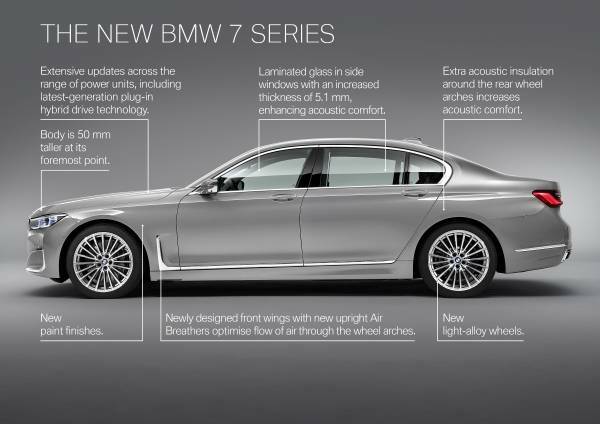 Spearheading the line-up of engines for the new BMW 7 Series is the 12-cylinder petrol engine. This 6.6-litre 585hp unit with a peak torque of 850Nm is used to power the BMW M760Li xDrive. Top speed is electronically limited to 155mph. The benchmark zero to 62mph sprint can be achieved in 3.8 seconds* while CO2 emissions are at 282g/km*. The BMW 750i xDrive features an uprated 4.4-litre V8 that offers a maximum power output of 530hp – 80hp more than the engine it replaces. Peak torque is up by 100Nm to 750Nm. The flap-controlled M Sport exhaust system fitted as standard produces an exhilarating soundtrack to match the power delivery. 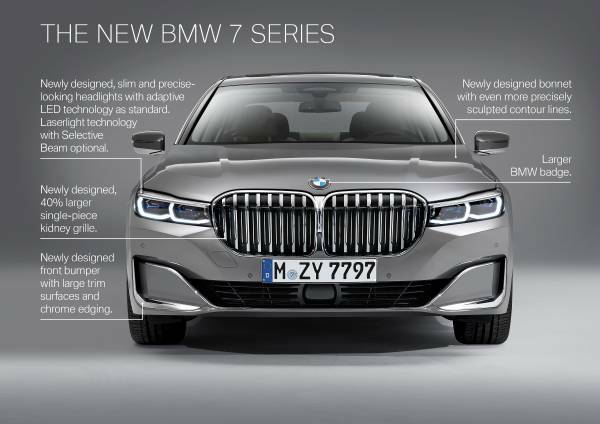 The new plug-in hybrid drive technology enables the BMW 745e and BMW 745Le xDrive models to record zero to 62mph times of between 5.3 and 5.1 seconds while achieving an electric-only range of between 50 to 58kms*. The speed threshold for all-electric driving has also increased to 68mph. The combined fuel consumption figures for the plug-in hybrid luxury versions are between 2.2 – 2.6 l/100 km*. The CO2 emissions produced when burning fuel average between 48 and 52g/km*. Parking Assistant Plus comes as standard in Ireland and aids parallel parking and Active Park Distance Control (PDC). This pack also features Reversing Assistant, which helps the driver to exit parking spots or manoeuvre when space is limited. This system is the only one of its kind in this segment and offers automated reversing in confined spaces. This is done by storing the steering movements made during the vehicle’s last forward manoeuvre when travelling at speeds up to 22mph. The system is then able to reverse the vehicle for distances of up to 50 metres by steering it along exactly the same line it took when moving forward. All the driver has to do is operate the accelerator and brake pedals and monitor the vehicle’s surroundings. The standard BMW Live Cockpit Professional comprises a fully digital, high-resolution instrument cluster behind the steering wheel with a screen diagonal of 12.3-inches and a Control Display measuring 10.25-inches across. This package of equipment also features an adaptive navigation system and a hard-drive-based multimedia system with up to 320 GB of memory. 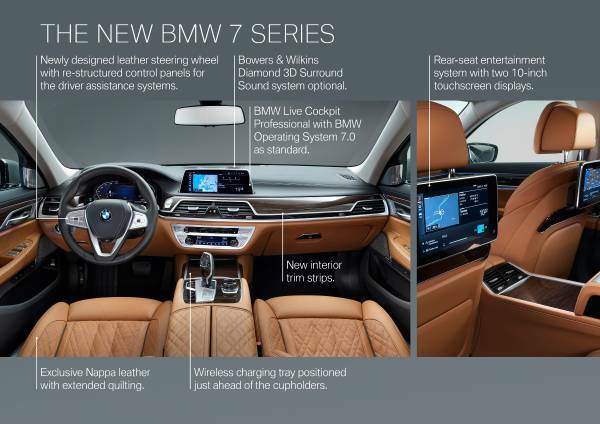 The BMW 7 Series is on sale from 13 April 2019 with prices starting from €96, 160 RRP. * Fuel consumption, CO2 emissions and power consumption are provisional, and were measured using the methods required according to Regulation (EC) 2007/715 as amended. The information is based on a vehicle with basic equipment in Germany; ranges take into account differences in wheel and tyre size selected as well as optional equipment and can change during configuration.